Happy Easter weekend dear ones. I hadn't planned on getting this post up before next week, but then sweet Ava and I got a bad head cold, which turned into a contagious lung infection and our whole Easter weekend is now cancelled. That said, I have plenty of time on my hands for resting... and blogging! 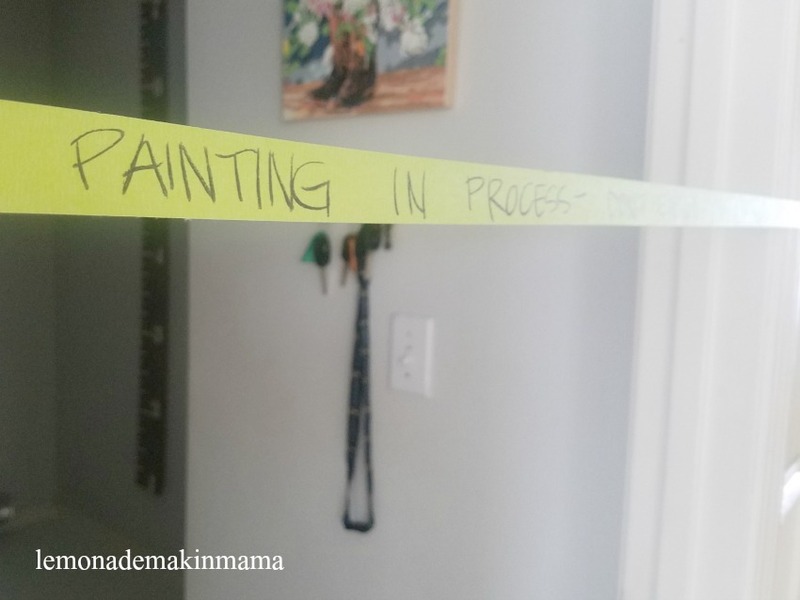 I couldn't be more pleased to share this post, and you have my permission to wholeheartedly flip out over this post about painting old linoleum and creating something beautiful and on-trend, with a statement tile look. It's even better in person if you can imagine! A few weeks ago, my friend Kristin and I went for coffee at our friend Becca's house. 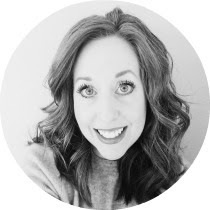 She is one of our uber-creative DIY friends who inspires us constantly with just plain, good ideas. We three all worked together at our previous organizing job and honestly both of those girls just keep me going in life. Becca also introduced us to the Madame Chic books, which I still say changed my LIFE. Anyway, she shared a bathroom floor that she had painted with me, while I was there and I couldn't believe my eyes! She used a different stencil, but talked me through the process she had used and my creative wheels began to turn. Becca had previously been an Annie Sloan chalk paint instructor so she gave me the low-down on using chalk paint, and I knew I had to try this! We have lived in this sweet little house for nearly fifteen years and there are a few places that haven't been touched. They are also the places we are seeing wear and tear, but as we plan to downsize into a condo in about two years, my husband is sticking pretty firmly to not putting any big amounts of money into this home for changes other than upkeep and simple cosmetic beautification for potential buyers. I get that. I presented him with this idea and promised to do all the sweat equity. He finally agreed because my enthusiasm is contagious apparently. (grin) And also, because there were a lot of dings and scratches on the laundry room floor and I think he figured that I couldn't make it too much worse. 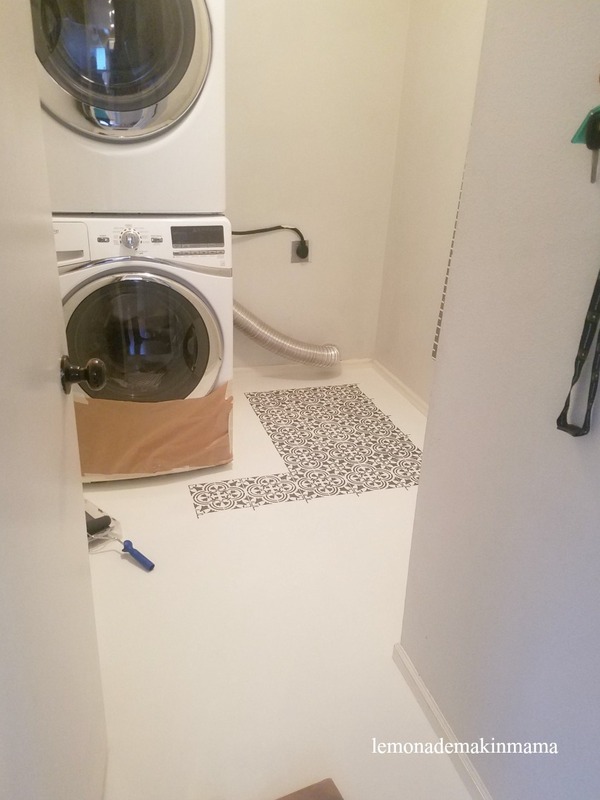 Our laundry room connects us with the garage, where we enter the home, so the door stays open much of the time. (You can read a post I wrote about how we stay organized in this space, here.) I'm happy to report, that after this project, I may never close our laundry room door again! This project is the perfect solution if you've got an old floor that you don't have a budget for updating. The only downside that I can see, is that it takes days to get it done right. Day one: Remove everything from room that can be moved. We opted not to move the washer and dryer out.) Sweep floor. Clean tile with a mixture of TSP and water. (TSP can be purchased at a paint store.) Let dry. Wipe floor with clean, warm water. Let dry again. 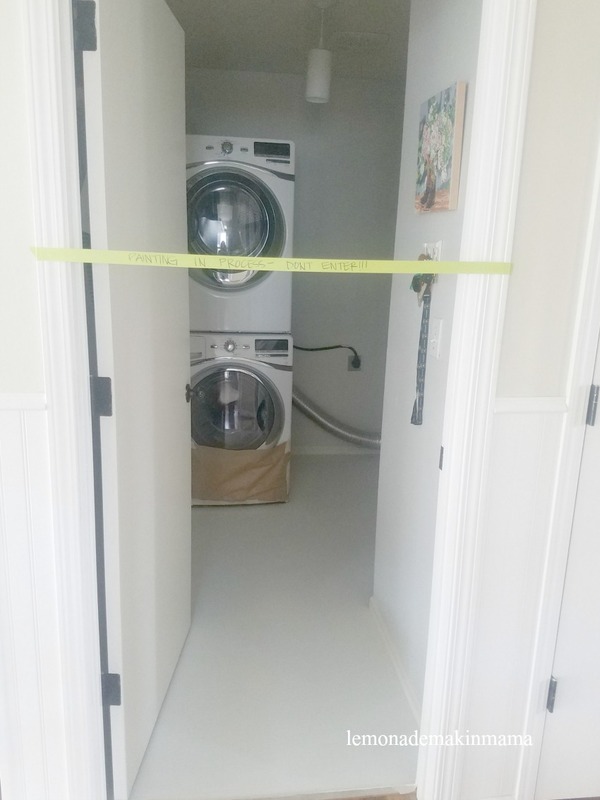 Tape off entire floor, wrap appliances in paper and tape off. Paint very thin coat of chalk paint. Let dry overnight. Day two: paint second, thin coat of chalk paint. Let dry overnight. Day three: paint third coat of chalk paint. Let dry overnight. Day four: Stencil design. I used the grid pattern of my existing lino, to keep the pattern straight. I also chose a stencil that was the same size as the existing "tile" pattern. I used a small, foam roller and rolled every whole block that I could. Once that was dry, about six hours later, I went back and began working my way around the edges, cutting the stencil where I needed to. If I hadn't followed the grid, this would have been easier but I was worried the original grid might show. (It wouldn't have so don't make it more work than you have to... just begin in a far corner and work your way out.) Let all dry, use a small brush for any touchups... and let all dry over night. Day six: Remove tape and move things back in... enjoy!! *I tested my stencil on cardboard using both a stencil brush and a roller and the roller was the hands down winner for clarity, lack of bleed, and time-saving. *I used a little masking tape on the bottom of my stencil to keep it in place each time. *I washed it completely, in hot water, and dried it thoroughly, about every six blocks. This kept the pattern crisp which is important for this project. You want nice, clean lines, not blurred messy edges. *I did cut the stencil apart in many places and did use scotch tape to tape some of those sections back together, for other necessary cuts and it worked surprisingly well. It was tedious but worth it. Actually it was a bit of a relaxing project on the whole, as I was alone, with nice music on. It's a mostly mindless project. *I used a mini-foam roller and tray from Lowe's (about $5) for the whole thing, washing out the cover and tray after each color was used. In between coats, I zipped the whole batch of materials into a project keeper (Sherwin Williams) that kept the roller and tray from drying out. I highly recommend this! Especially for those first overnight dry coats. *I did tape off all of the doors to keep people from accidentally walking in. Here are the project links! *I used this "Augusta" patterned stencil from Cutting Edge Stencils. *I used this Valspar Chalky paint from Lowe's. I chose the color "kid gloves" for the base, and "opera gown" for the pattern. (Love these color choices!) I think I only used half of each of the quarts, for the whole project. *I used this one-coat polyurethane from Lowe's. *I used this mini foam roller/tray for the whole project. Okay dear ones... you know I'll do my best to answer any questions in the comments that you may have. I hope this project gives you as much hope for loving what you have, as it did me. Just some tweaking can freshen things up again and it doesn't have to be expensive to be lovely. If you're dubious about how this would look in real life, I want to reassure you that it is fabulous. It's even prettier in person, than in these photos. If you can commit to six days of chaos while this project is under way, remember that each coat only takes about fifteen minutes to apply, the majority of those days is drying time. That's not bad for a low-commitment project with a massive payoff. One final thing to note... because the base color was so close to my trim color, there was zero bleed through with the taped off edges, in fact, that created a perfectly crisp edged line. We're going to have a super relaxed Easter weekend now, since we're all so sick... but since this is my very favorite holiday I suggested that we at least have family communion set up. I wanted to share in case you wanted a simple idea for this as well. Just some juice, and/or seder wine in carafes, a bowl of crackers or matzah bread and candles if you like. Add some goblets and people can gather or just go to the table on their own... I sprinkled these decorative nails that I found a couple of years ago on Amazon (sorry, the link is goneon the bread board as well for a reminder of what we are celebrating this weekend. 1) Choose your flowers. Tip: select flowers that will compliment one another. As your peruse the floral department, take a cue from pre-made bouquets and choose flowers that seem to belong together in color. For mine, I knew I wanted to work with some greenery next to my home, so I selected some flowers in whites and pinks. 2) Choose your vessel. I used several bowls and made a few arrangements. This was a bowl I began with, but later moved my flowers into something a bit higher. Have fun playing with whatever containers you prefer! 3) Cut floral foam to size, and then soak it in water. I make a sink full of water and let the foam soak up as much water as it can hold before transitioning it to the vessel I'll be using. 4) Lay out supplies such as nippers and scissors. I like these sturdy garden clippers as they cut through tough stems easily. 5) Separate your blooms and prepare them by stripping or trimming them at bottoms. Just clean them up a bit so no foliage will be in water and trim each end before placing them into the floral foam. 6) Build your base. I made this one rather full because I really liked the leaves on their own. You can always remove any later, if need be. 7) Begin filling in with the rest of your flowers, turning them, and adjusting the arrangement so that all sides are balanced. Be artistic and let them arrangement take a shape of it's own. No need to stress about perfection, just enjoy this peaceful process. 8) Add or remove anything that is needed. Important tip; Place flowers into the foam once, and if they need to be pulled back out for any reason, make sure to insert them into a new hole. 9) Stand back and admire... Honestly, using hidden floral foam in a container is almost stupid easy. I don't think it's possible to even mess this up. If you're lacking confidence in choosing flowers and greenery, you can always purchase a pre-assembled bouquet, bring it home and use these steps to create something that looks like it came from a florist. And before I close, I wanted to share a few fun spring home pics... Tomorrow, Joe turns seventeen and hates cake. So yesterday I assembled a little donut cake. He LOVED it. He didn't even want to break into it because he didn't want to mess it up. I thought that was cute... and told him to ENJOY! We went a little old school with these army men because I couldn't think of anything to decorate a seventeen year old's donut cake with... apparently this was perfect because he's lining them all up on the counter top as he removes his donuts... haha! The blooming branches were from the tree in my front yard and I love the soft pink against the "It is finished sign" I painted. Simple statements of spring, rather than an overdone space, really help me focus on the reason for these holidays and I like that. So easy to get caught up in all the glitz in the stores, no matter the season, isn't it? Don't laugh at me... but today I found myself creating yet another blank wall space with nothing hanging... I tell you, it's a phase of life that is giving me so much breathing room. I won't lie, I love it! Anyway, dear ones... I hope you all have a lovely Easter and enjoy your time with loved ones. I know we'll be sorely missing my daddy this year, but Easter is my all time favorite holiday and I plan to soak up every bit of love, rest and peace as I can get! You do the same. I can hardly believe that we're already into the start of spring sports season! This, coming after a weird week, with snow, hail and rain. Alas... spring sports are upon us. I've always felt like there should be a book for high school sports moms. There should be a section for each sport, telling us what we need to know about rules and what's involved in training, etc, how to cheer and not look like an idiot, great ways to snap action shots of our kids, ways to be prepared, meals to make ahead during the on-season that give kids great carbs and nutrition, and ways to manage the variety of household schedules so everyone is on the same page since dinners together aren't something that come easily, tips for dealing with other parents and non-awkward small talk ideas... just ALL of it. I sat there shivering, my back aching, wishing I had a snack, a water and a better seat... and I decided then and there, I was going to be much more prepared the next time I had to do this. Being prepared is really important for events that are located out of town as well. This is by no means an exhaustive list, but it is primarily a gathering of items I have personally needed and wished I'd had, or items that I used while we were in season. *A really great baseball hat. Never underestimate the power of a cute hat on a bad hair day, or windy weather, or if you lost your sunglasses. *An extra trash bag or two (Perfect for muddy clothes or shoes, and so versatile. You can line a seat or floorboards with them, carry gear in them, and even bag up trash from the bleachers for the team. *Warm footwear- duck boots such as these, are my favorite! (Can't recommend these enough. I was so tired of my toes freezing.) I got mine on Amazon. Best money every spent as a sports mom! *Packable down coat (preferably long in length) This is a favorite of mine, and you can get them in all kinds of styles and varieties. I like that mine packs into it's own pocket for space saving. I couldn't find my coat link, as it's been discontinued but this one is very similar. *Stadium seats- we've got two collapsible ones like these, from Amazon, but I love this quick-fold down style best so that one's mine! After that first meet, I got my act together and I've been as prepared as possible ever since. (I did learn the hard way, that always keeping baby wipes on hand, is just plain smart.) Like all things in life, it's a lot smoother sailing, when you've prepared in advance and though we all can't think of everything all the time, being organized really does help. I hope this post encourages you as you prepare for events in your own life. If you tend to be a well prepared person, we'd all love to hear any additional tips that have helped you get through those busy days, nights and weekends. Please feel free to share with us, in comments!